-With a very sharp peeler or paring knife, remove all the outer layer of skin on the kolrabi. It can be a bit fibrous. Peel the carrots as well, or leave the skin on if you prefer. 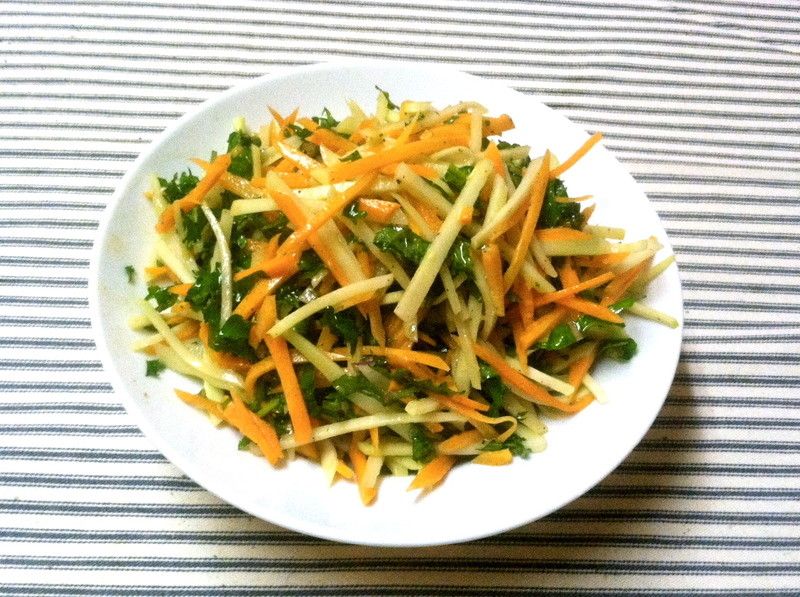 -With a sharp knife, cut the kolrabi and carrots into slices then into sticks, or just grate on a box grater. The kale you’ll want to slice as thin as you can. -Place your veggies in a large mixing bowl, and add the oil, vinegar and mustard and season to taste. Mix and let sit for 5 minutes. Easy breezy! -The crunch is the best part of this dish, so I would not do it too far ahead. -Kolrabi is very nice pan roasted. just peel, cut into bite size pieces, and pan roast with a little oil, until they color a little and are tender. -The greens can be removed and cooked like collards. May take awhile, but they are delicious!